I have always been crazy about animals, and the tiny dog did not escape that passion. I married at a pretty young age and the thought of being able to purchase my very own pets  well you can imagine. On honeymoon, I spotted a Saint Bernard and back then, a Saint Bernard was a dog you just never saw. So one was ordered, and some months later I collected Bridgette from the Airport. My dentist at the time, who came from overseas and whose clients/patients included some of the very well known actors there, well his brother, bred Whippets, and exported them all over the world. Two remained from a litter bred. I was offered one, as a companion for my Saint Bernard. Doc Louis as we called him(after my dentist) then came to live with us. I worked as a receptionist a PA as it would be called today, at my Dads own company, so I had the opportunity of my dogs, being able to go to work with me. WOW, that was just too good to be true. The one member of staff would walk the dogs, periodically during the course of the day. Not long after that, we got a show budgie, and that believe it or not also went to work not in a cage but sitting on the Saint Bernard.
. The Toy Pom breeding came to a very abrupt ending. After this breeding experience that I would not wish on my worst enemy, I started with my own family. I gave up work in early pregnancy and had two children. I was once again bored and not long after this, I purchased my very first yorkie. I wanted small, but never expected him to weigh 1kg as an adult dog. This started me on a never ending road, with Yorkies. I also got very involved with the Persian cat, the showing and breeding of them. I decided to Breed the yorkie, and having had the experience with the TOY POMS, I knew that you just never bred that smaller dog. I also noticed when I purchased my first yorkie, that the mother dog, was not small, but the father was smaller, but most certainly not TINY and the result was that small boy I had, the litter sister was considerably bigger. My initial breeding of the yorkie many years back, resulted in the normal sized Yorkies being bred, not the standards, the miniature as we know it today, (2.5kg and 3kg adult weight dogs).. Sometime down the road, we started producing that odd tiny dog. The first time it happened, I was most surprised, both parents were anything but small. The stud weighed a good 2.5kg and the Dam at least 3kg, they were not BIG dogs, but they most certainly were not small either. In the first litter we produced, two females were born, the one the size of the parents the other one, very small. 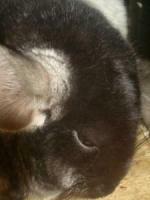 (900gms fully grown) The very small one was sterilized and we continued to breed with the bigger one. We obviously had a number of other Yorkies and as time went by we would find the smaller pup coming along, we NEVER bred from those smaller dogs, but would keep the odd pup from that litter where those small dogs were coming from. 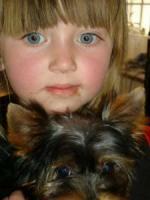 We have always had numerous lines in our Yorkies, and therefore we NEVER HAVE AND NEVER WILL interbreed our dogs. Irrespective of who got mated to who, we kept producing the odd small dog. Years went by and regularly those small pups would appear. There was no set pattern, no special recipe and the strangest thing of all, was breeders I knew at the time, had exactly the same lines, the litter mates of the dogs I had purchased and those breeders never bred the first tiny ever. People would joke with us  saying do you starve your dogs, do you put something in the water, do you give then brandy??? It became a huge joke with our friends and fellow breeders. Down the line, many years later, we still produce on a regular basis those small dogs, and in some cases the small has become major small, resulting in what I have classed the genuine TEACUP for a good few years now. We have never gone out of our way, as so many folk have, to try and produce those really small dogs. The gene is now carried in our lines. We often see those extremely small pups in a litter, and often it is not just one pup, it has been as many as three pups in one litter. This has resulted in my asking the question to those who question our producing of those really tiny dogs, can you get three runts in a litter???? A runt, as I have mentioned in numerous articles I have written over the years and some of those articles do appear on this site, is a pup that has issues health wise, and they do not go unnoticed. A genuine tiny pup, is a healthy pup from day one, may be considerably smaller than the litter mates, but eats from an early age, as do any of the smaller sized Yorkies, 3 weeks of age to be precise. It shows no signs of being sickly or compromised in any way. They are perfectly healthy and live every bit as long a life as the normal bigger Yorkie, but this obviously is at the hands of their owner, the owner ensuring they are looked after properly. Irrespective of what is said or put in print by some persons, you only have to know that our dogs are all microchipped prior to leaving us. All vet checked, their health guaranteed.